Murudeswar is the name of Lord Shiva. This beach town is located in the Bhatkal Taluk of Uttar Kannad district in the Karnataka state. 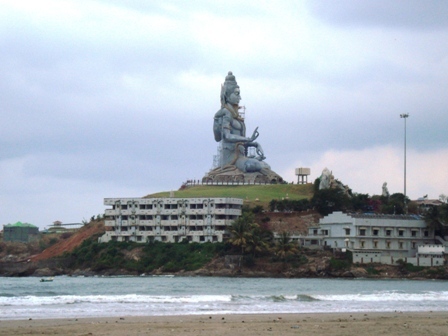 This town is famous for the second-tallest statue of Lord Shiva. Mostly tourists visit this place for this Murudeswar temple. Many of the time, during festivals, the temple remains crowded with devotes and so also the sea beach. Apart from being a pilgrimage center, this beach is also home to many beach activities, adventurous activities and sun bathing. Sight-seeing is a major option that one can have on this beach. The natural sight, the clear water and the cool air on the beach attracts many of the tourists towards this beach. Many come to enjoy only the nature and on way they pay visit to the temple. It is a great place for devotees as well as nature lovers. The peaceful atmosphere on this beach enchants many nature enthusiasts. The atmosphere in the early morning and the dusk hours are too enchanting. The tourists can feel the peace bestowed by nature on the mankind here on this beach. The early hours of the morning are great for introspection. One can spend the evening here by taking a stroll on the beach. One can watch different natural sights on this beach. It is great to enjoy the flying seagulls and Kingfishers. There one will find many water sports as well. Swimming and bathing are very common for the tourists but they also love to explore some of the adventurous activities like parasailing. One will find many colorful parachutes offered by the locals on the beach. With the local fishermen, the tourists can also enjoy the boat ride. The boat ride takes the tourists near the Kandukagiri hillocks. Apart from all these entertainment and engaging activities, one can have great delicacies on the beach. It offers coconut sweets, fish curries, rice items, and fruits. If one plans to spend the whole day in the beach, one will not be hungry on the beach. There are enough opportunities one will find to satiate the taste buds. The wonderful backdrop and the availability of food in the nearby areas make the beach a wonderful place to picnick and use it as a gateway that takes one away from worries and tension. Accommodation is not a big problem here, if one expands one’s stay in the beach, one can stay in the temple cottages. The nearest station is Bhatkal. It is only 16km away from the beach. One can get trains connected to this place from many major Indian cities. State transport buses and private buses are available for Bhatkal. Many major cities connect to this place. From Bhatkal one can hire auto rickshaw or Taxis to reach the beach. The ideal time to visit Murudeshwar beach is from October to March. One can stay there for days to enjoy the natural beauty of the beach and the small beach town.